Visual Studio Code>Programming Languages>MatlabNew to Visual Studio Code? Get it now. 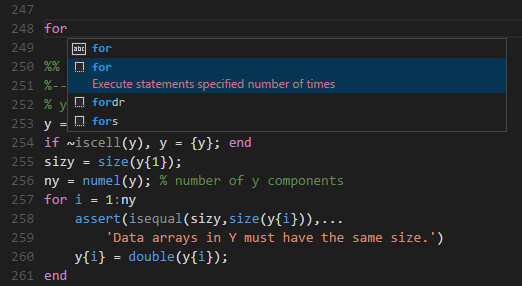 This extension adds language support for MATLAB to Visual Studio Code. Like this extension and would like to help me? Know some code? Contribute, head up to the issues and start killing those pesky bugs. Don't know how to code? No issues, you can buy me a beer, or a coffee :smile:. Uses mlint for checking the MATLAB code for problems on save. Select MATLAB in the list of languages. 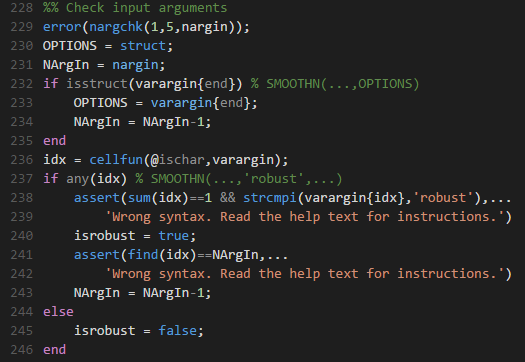 Alternatively, saving the file with a .m extension, will allow VS Code to understand that it is a MATLAB file, and automatically select the language correctly. On the right pane, where you have the settings.json file open, add to the json file. "matlab.mlintpath" : "path to your mlint.exe file"
Now, when you open a Matlab document (.m), VS Code displays warnings and errors. Remark: If you don't want the lint on save option and you want to remove the error message being displayed when the extension activates, change the matlab.lintOnSave option in the settings file to False. By adding "matlab.linterConfig" : "path-to-linter-config-file" to your VSCode configuration file, you can pass a configuration file to the mlint call. Check Matlab's documentation to create this configuration file. For some languages, like Chinese, the return of the linter is not using the default utf-8 encoding, but a different encoding (gb2312 for Chinese). If the linting doesn't show correctly, change the matlab.linterEncoding to the encoding used by your Windows console. For example, if your Windows is installed in Chinese, add "matlab.linterEncoding" : "gb2312" to your settings.json.